Innovaya provides innovative software technologies for the architecture, engineering, and construction (AEC) industries. 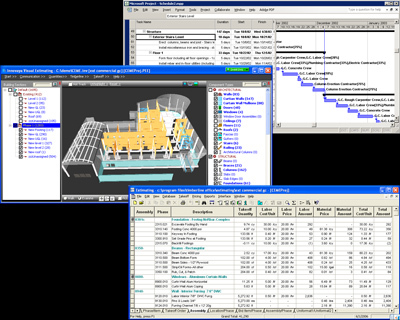 These technologies, based on building information models (BIM), help AEC firms to maximize the potential of computer tools in design and construction processes. Companies that wish to gain advantages in today's ever competitive AEC markets will find Innovaya solutions beneficial. Streamlined, Fast, Accurate, and Easy-to-Use ! Once Again! - Innovaya 5D BIM Software Named Top Commercial Product 2013 by Constructech Magazine. Mortenson Construction presented success stories of using Innovaya Visual Estimating for 5D BIM-Estimating. Best Practice - Innovaya Discusses BIM for Construction at Autodesk University Kevin Yu, President and Founder of Innovaya, presented "Aspects of Using Autodesk Revit for 4D/5D BIM Construction". Hensel Phelps Construction Co. showcased success stories of using Innovaya Visual Estimating for 5D BIM-Estimating. Innovaya Visual 4D Simulation - a powerful yet extremely easy-to-use award-winning 4D planning and constructability analysis tool supporting MS Project and Primavera. Improve coordination, communication, and produce optimized construction schedules. Innovaya Visual 5D Estimating - the first true BIM-based estimating award-winning solution to integrate AutoCAD Architecture/MEP, Revit® Architecture/Structure/MEP with MC2 ICE, Sage Timberline Estimating, and MS Excel. Take your BIM to Estimates. Copyright 2014 Innovaya, LLC. All rights reserved. Trademarks.